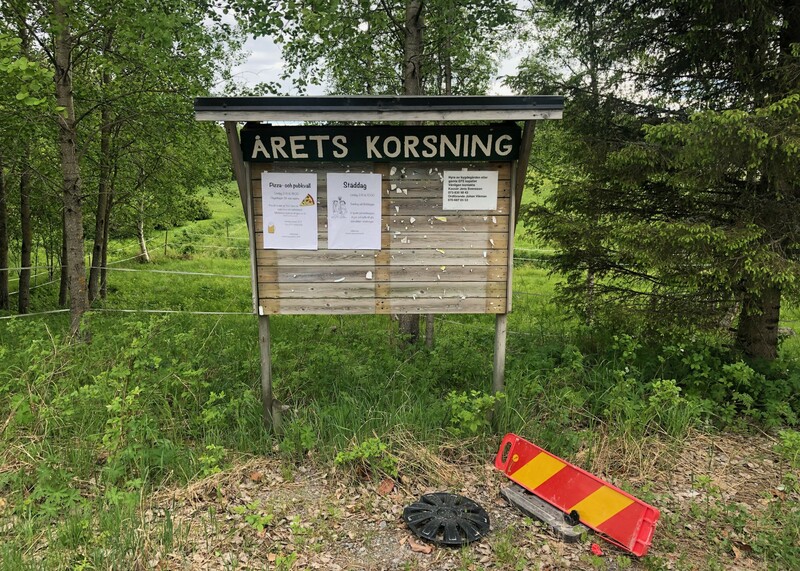 Årets korsning, Ryssbält, Kalix kommun, Norrbotten. Foto: privat. On the coast between Töre and Kalix lies the small village of Ryssbält. I have gone there every summer and many winters. My grandmother grew up on a farmhouse there, and I in a summer house. In the middle of the village there is a junction. If you turn left, you’ll reach an area with small houses. If you go right, you'll reach another. There is really nothing remarkable about this place. It looks like any junction, in any town in Norrbotten. But it is precisely at this one, that someone has put up a sign reading: JUNCTION OF THE YEAR. The sign has been there for at least 15 years. It's the Junction of the year, every year. This is no longer a place you can pass without noticing. I run the publisher, record label and production company Teg Publishing together with my brother Anders Teglund. We originally come from Luleå and in that summer cottage in Ryssbält we also run a residency programme for cultural workers together with our parents. People often think that we only publish literature, music and film from Norrbotten. We do not. But we're from there and so are many others. We have published some of them. But speaking about one’s origins as if it was especially significant ... it somehow makes me uncomfortable. It is something that can often lead to either nostalgia, exoticism or patriotism. Three phenomena that ought to be avoided. But this does not mean that we should not talk about the place, what others have done to it, and what it does to us. What it looks like. Norrbotten is no more special than other landscapes. When we were asked to edit an issue of the Lulu Journal with the theme “The Landscape of Norrbotten”, that was what I thought. In this issue we have collected a selection from our catalogue. They are all different expressions that do not really have much to do with one another, but they resonate with us, and maybe with others, too. The purpose of our work has never been to portray Norrbotten, we have only found individual works that we wanted to promote, and which felt important to us. I think it’s probably a more personal landscape than it may seem. That the images we present are specific rather than general. I think the idea of a landscape is constructed only retrospectively. “The road looks like the road”, the poet Pernilla Berglund writes in her collection Fälla. A line that sums up our programme. When I read Pernilla Berglund's poetry, I understand everything and nothing, and I interpret it in which ever way I please. I read them, and think thoughts that cannot be put into words. “The roads are as different as I am”, continues the poem. It has not always been a given to me that it is possible to write about Norrbotten. It was only as a young adult that I understood that you can write about any reality, even ours. That it is allowed to take our existence and seriously or lightly as any other. An experience from growing up in Norrbotten is that our places were not mentioned. They were not on TV, our roads were not written into books, and our voices were not amplified. Not that it’s much to whine about. There are other positions that are even more marginalised, but ... that it how it was. And at a time when cities and countryside are falling apart, it becomes especially important to render such images. It is an antidote to the lack of historical awareness that comes from no one talking about why we are here and why it looks the way it does. This is what Po Tidholm says in the audio report Iron Cages, which we released in 2017. A documentary about the industrial exploitation of raw materials. I am thinking about what new perspectives I have gained from Po Tidholm's articles and texts, how, in many ways, they have given us a history. How the economic practice and proxy-colonialism of the state materialise through our lives. It was a profound experience first reading the script for Norrland, which we published in 2012. I had never read anything about this before. On my mind, for instance, is what Tidholm wrote about "the constant threat of violence”, which suddenly offered new models for explanation and feeling with regards to my own background. And that it begins there, in economics and in politics. I am thinking of David Väyrynen's accurate insights into something as volatile as the mind. What exists in language, speech and thought. How that can provide a foundation for commonality. And I am thinking about how his text Hemvändervisan (The Ballad of Homecoming) is invigorated through Sara Parkman’s musical score. Do you hear what it sounds like? Like tradition and history. It's not, it's brand new. But it feels like you never heard it for the first time. I am thinking of Sven Teglund's watercolours from Porsön, the residential area in Luleå where I grew up. Where Sven, who is my father, still lives. How the light from the ironworks is reflected in the clouds that blanket the sky on particularly cold winter nights, casting a special light across the bay. How that same sky also lights up over pizzerias in brown brick houses, and in Sven’s watercolours. It acts as if it were something remarkable. “The night colours the sky red like blood" Mattias Alkberg sings in Ingen sömn på Stengatan (Sleepless in Stengatan). It is the same sky, the same light. And maybe this is the first time ever that Porsön features in a pop song. I hear it, and it feels like the place exists, or as if it did not exist until now. Not because I think the biographical has to play such a big part, or that one must share that specific experience in order for the feeling to be transmitted. It could also look like something else. Clara Bodén made a film based on the song, but from her own perspective. She has a different outlook, but still it's the same sky, it's just that here, the red is black and white. Both the song and the film spotlight night workers and others who are awake at night in Luleå. Those who take the bus, those who walk among piles of snow, never wearing enough clothes. “Times and places shine in time”, the Norrbotten poet Verner Boström once wrote, in a thousand different ways. The red sky over the road. All that is real. Here are some people who were there, and saw it. Boström, Verner, Länder, Luleå: Black Island Books, 2006.